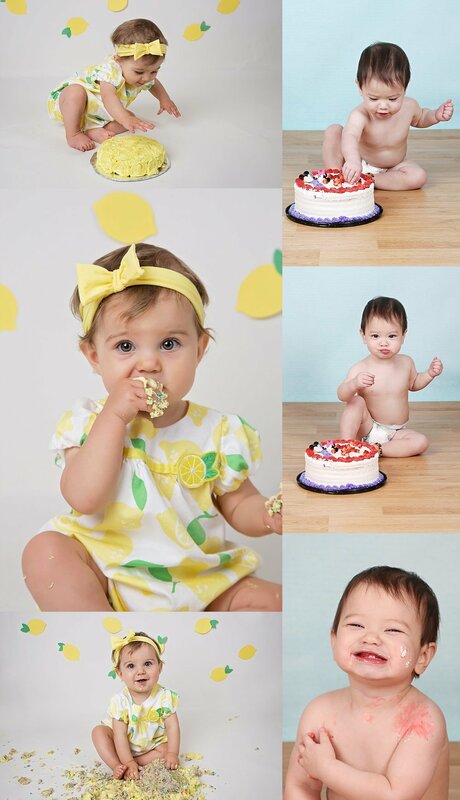 Super Cute Lemon Cake Smash Photos Were So Much Fun to Photograph in My Calgary Studio! When Allison's Mom told me that she was having a lemon themed birthday party I was excited to incorporate the theme into her cake smash photography session! We started out the photo session with some adorable one year old portraits. I had a gorgeous lace outfit and headband which went perfectly with the pink background and little bed. After we'd photographed a few one year milestone images we started the cake smash. The lemon decorations and lemons were from her birthday party. I added those to the background setup and her Mom brought an awesome homemade lemon cake (I kind of wanted to eat it instead of smash it!!). To top everything off she had the cutest lemon outfit and yellow hair bow. The entire cake smash was pretty much the cutest thing I've ever photographed! Allison made short work of the cake. She smashed it in no time at all and enjoyed every minute. I was able to capture so many beautiful photos and capture some incredible smiles and expressions! So much fun! I love cake smash photography! It is so much fun to capture the amazing expressions and mess that a sweet little one year old can make. However, some kids don't like their cake smash right away and there are some tips that can help the cake smash happen without any tears. 2. Plan Around Naps - When scheduling the cake smash photography session make sure to think about nap times. Kids are always happier in the earlier morning or after an afternoon nap. It's best to schedule the photo shoot well away from nap time to guarantee those adorable smiles and content attitudes. 3. Bring Treats - Bring your child's favourite little treat to sprinkle on top of the cake. A few cheerios, gold fish crackers, or a bit of fruit can do wonders for getting a child to reach for their cake. Even if they don't like the cake it looks like they are reaching for it and touching it. These small treats can be easily hidden in the cake or Photoshopped out so they don't affect the photographs. 4. Wear Easily Washable Clothes - This tip is for the parents. Even though this cake smash photography session is for your child I guarantee you will get messy! You will be helping your child get into position if they crawl or walk around and you may even have to help them smash up the cake a bit. You will get icing and cake on you so be prepared by wearing some old, easy to wash clothing. 5. Relax and Have Fun - Babies are incredibly responsive to our moods. Having professional photos done can be stressful but the more you can relax the more fun your baby will have. There's no rush. Take your time and let the baby get used to being in a studio, the lighting, and the photographer. The photographer will have lots of tricks to get the baby smiling and into the cake. I was so excited for Zoe's cake smash photography session. She is just the most adorable little girl. She came into the studio and we captured some gorgeous photos of her before we started the cake smash. Zoe really enjoyed her cake and was full of smiles. She was quite messy at the end which makes for the best kind of cake smash photography! 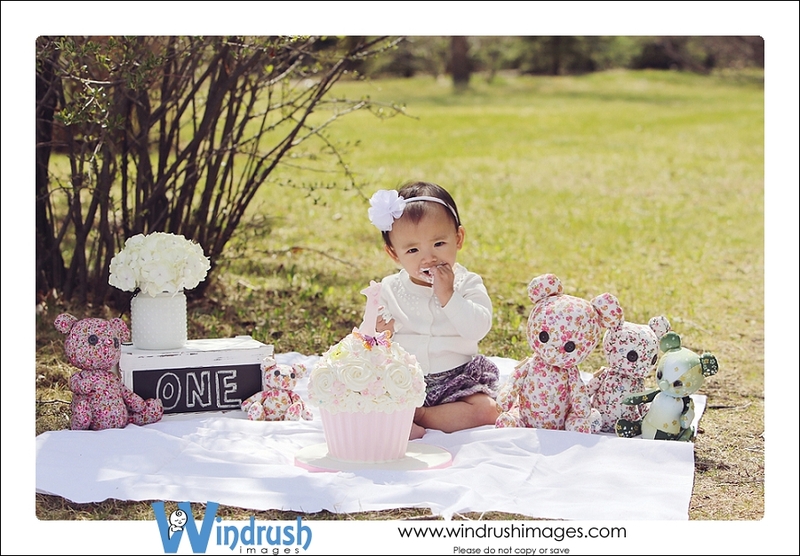 Isla's family wanted to have her cake smash photography session outside so that it would have a picnic like feel. Outdoor photography sessions, in May, in Calgary are always touch and go. Luckily it was a beautiful sunny day although there was a slight chill in the air (so we needed to keep her beautiful sweater on). Isla's Mom is extremely talented and handmade the entire set, including the cake, teddy bears, and skirt. It was such fun celebrating Isla turning one! Cake Smash Photography, Calgary - Ana Turns 1! It's always fun to celebrate turning one! It's such a huge milestone and a fun time for photography! I had a great time capturing Joel turning one with some cute one year old portraits followed by a cake smash. Here is a before and after shot. So adorable and messy!